Add a sparkling sense of whimsy to baked goods with these quirky, confectionery treats. Working from her studio in Georgia's historic Grant Park neighborhood, artist and chef Suzi Sheffield takes the business of sprinkles seriously. Starting with two eight-inch butcher blocks and a whole lot of sparkle, Suzi and her team hand-blend the perfect combination of pastel sugar wafers, colored nonpareils, chocolate drops, and more to create a frivolous batch of sweet confection. 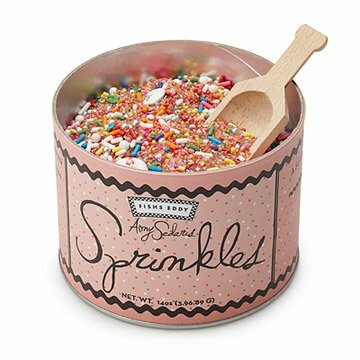 Complete with button-shaped chocolates bearing collaborator Amy Sedaris"s hospitality slogan,"I like you" and a wooden spoon for serving up the sweet whimsy, this adorable tin of party sprinkles is perfect for topping off baked goods or providing a quick and delicious pick-me-up. Handmade in Georgia. Whether she's orchestrating a white tablecloth dinner at the New York City Ballet or sifting through a batch of lavender in her Grant Park studio, one thing is certain: Suzi Sheffield's passion is in the kitchen. After spending over a decade as a restaurateur and caterer, she craved a change of pace. So, drawn to the idea of crafting handmade home goods that likeminded culinary aficionados could enjoy in their own kitchens, she brought her artisanal dry goods company to life. It was born of her love for those who work with the land. Thus, all the ingredients in her salts, sugars, and other sundries are sourced and gathered with integrity: locally gathered herbs, foraged mushrooms, organic spices, and hand-harvested salts from around the world. Thanks to her creativity and years of experience with specialty foods, Suzi is able to expertly blend uncommon and unexpected ingredients, resulting in one-of-a-kind goods that lend exquisite flavor to fine cooking. This is the perfect accoutrement to have a dazzlingly beautiful but simple white cake or cupcakes! Good gift idea for my Goddaughter who loves sprinkles! Part of the appeal was the wooden spoon, which I don't see in the container. Hopefully it's buried in the sprinkles. Fun addition to a birthday gift! I gave my daughter a gift per day the week prior to her 40th birthday......this was so fun because her 5 year old likes to "bake with Grammy" so we made Mommy a birthday cake and used scoops of sprinkles to make the cake special! These are gorgeous! They are unusual and look beautiful on my baked goods. While all sprinkles add a nice touch, these go above & beyond. Received tons of compliments. I highly recommend them. I plan to use these on cupcakes or cakes. They are so pretty I can't wait! Purchased as a "fun" gift for my husband. Lots of different treats in that mix!